A disaster is in wait for Americans in their retirement years. Too many Americans are dependent on the government (Social Security and public pensions – more on that below), instead of putting aside savings to ensure our financial security in our “golden” years. After a lifetime (presumably) of working, the median Boomer household (age 55 to 64), has managed to accumulate only $12,000 in retirement savings. $12,000 isn’t even enough to support one person, much less a household, for a year. 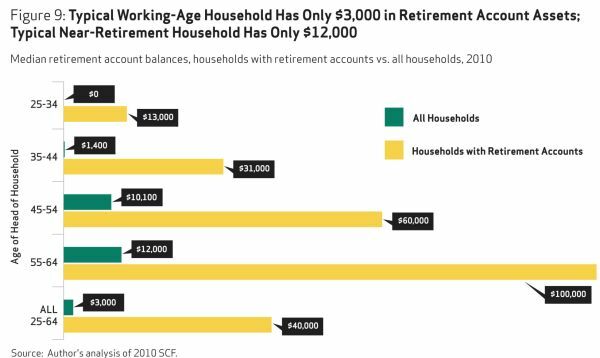 Since “median” is that figure that divides a population into two halves, this means that 50% of Americans age 55 to 64 have less than $12,000 saved for their retirement. But it’s not just the Boomers: Every age bracket has been living in a land of delusion. The median retirement savings of all non-retirement age Americans, 25 to 64 years old, is only $3,000. The entire country has bought into the ”live for today” mantra. And if you think you can rely on government in your “golden” years, think again. To begin, Social Security is broke. There is no “trust fund” because for years, the federal government has been dipping into that “trust fund” to make up for its budget deficits. The “trust fund” is an accounting fiction that exists only on paper. To make matters worse, even if we go by the mythical “trust fund,” Social Security will go broke in 4 years, by 2017, when it will pay out more in benefits than it takes in. In the 1950s, there were roughly 5 workers for every retiree; today, it is roughly half of that. With 78 million Baby Boomers moving into retirement, the demands on Social Security will be even greater in the coming years ahead. With demographics heading in the wrong direction and a much slower-growth economy, the Social Security Administration has moved up its estimate that the Social Security Fund will be exhausted entirely by 2033. According to a Social Security trustees report released in April 2012, SSD will run out of cash in three years, by 2016, when incoming payroll-tax revenue will cover only 79% of SSD benefits. Because the plan is barred from running a deficit, disability aid would have to be cut, which means SSD recipients will get only about 80% of the monthly payments they used to get. Then there’s public or government pension, whether federal, state, or local. As I explained in my post of August 18, 2013 (“Why there will be many more Detroits – in one chart”) and as the graph below shows, public employees pensions are, without exception, severely underfunded because they are based on the expectation that whatever money that’s paid into those funds gets 7% to 8% interest. The only problem is the Federal Reserve is and has been suppressing interest rates to an anemic 1-2% because if the Federal Reserve lets interest rates go up, our already gargantuan national debt of nearly $17 trillion (some say it’s actually $70 trillion) will balloon even quicker. The one chance we have is if we get a pro-growth leader in the White House and a pro-growth party in both houses of Congress. America is rich in energy resources. We can be independent in energy if we want to, instead of being reliant on oil imports from the troublesome Middle East. If we give free rein to oil exploration and development — instead of the Obama regime’s obstruction and hampering, in pursuit of the chimera of “green” energy by wasting millions of taxpayer dollars on unprofitable, corrupt, and ultimately bankrupt solar energy ventures like Solyndra (which alone received $535 million in never-repaid “loans” from the POS) — we can not only become energy independent but also create millions of jobs. The economy will grow and with that, we can grow ourselves out of our unfunded liabilities and our national debt. Great article Dr. E. This is a sad story and clearly shows a lack of understanding of simple economics. Add to that the federal government’s never ending desire to destroy our personal wealth and currency and they got us where they want us. Me? I knew this was going to happen and prepared for it, Thanks for the article, I’m taking it to me site with a link back to you. J.C.